Hats are great projects: they’re quick to knit, fun to wear, and rarely take more than one and a half balls of yarn. Another nifty advantage to making hats is that they give you a very good excuse to try out a new or intriguing yarn that’s caught your eye, especially if you’re just not sure whether you want to commit to making a full garment. A hat gives you the opportunity to see if you actually like how the yarn looks when it’s been knitted or crocheted; you can get a better sense of how strong the colour is, and which sections are dominant in a self-patterning yarn. Best of all, they’re relatively inexpensive. Buying two balls of good yarn for a hat is much less of a commitment than investing straight away in twelve balls for a jumper! This cute beanie hat is made from SMC Apiretto (a soft angora blend), and the pattern is from Sirdar 9884. It took exactly one ball to knit, though I knitted it in the round. To knit it following the pattern (flat with a seam) would probably take about one and a quarter balls, so 3 balls would easily give you two hats. I learned that this yarn would definitely be soft enough for a sweater, though the colour was brighter than I thought it would be. On the left, one of our popular Hita Hats, Switch, has been crocheted in Adriafil Unico Chunky, a soft and dense chunky yarn. On the right, pattern 9906 knitted in Faroe Chunky. When viewed only in the ball, it is not obvious that Faroe Chunky actually has a pleasant and subtle striping effect, along with the mottled colouring, but this hat shows it off very well. This cosy hat and scarf set was knitted from a single ball of Wendy Duo. This “one ball wonder” yarn comes with a free Wendy Bon Pom included, for finishing off the hat, and all the instructions are written on the ball band. The only thing you have to supply is the knitting needles! These final two hats feature some of our less well known yarns - SMC Lova and Adriafil Scozia. Each shade of Lova is a neutral shade with flashes of neon at random intervals throughout the ball. Free patterns for a simple, slouchy hat like this one can be found on our website (there are 12 designs to choose from), and it can be topped off nicely with a matching Wendy Bon Pom. Scozia has an excellent tweedy look when crocheted, and a soft handle to work with. For knitters and crocheters, it’s not surprising that hats have been a staple project for generations! If a full size hat seems like more than you want to work on at the minute, we are also collecting hats for Innocent Smoothies in our Stirling shop. 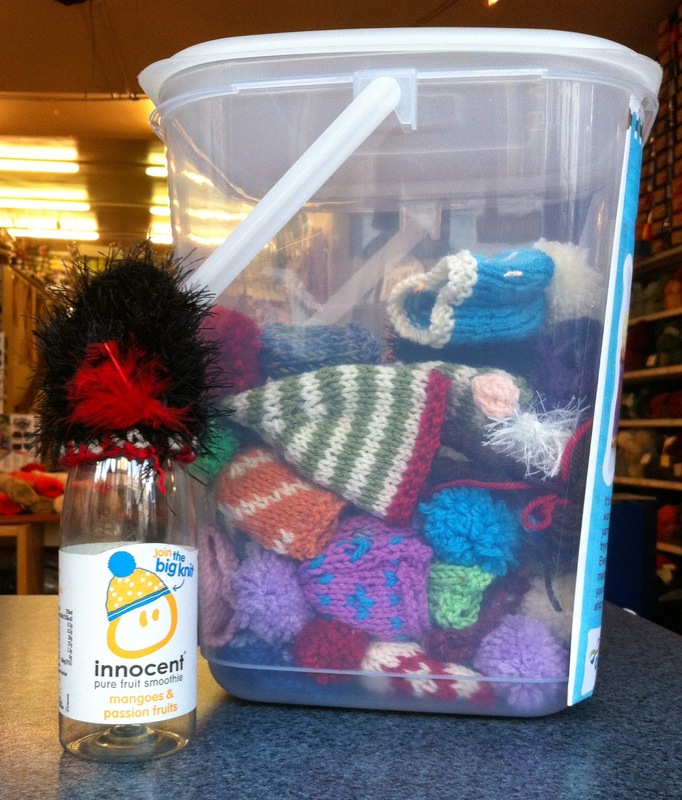 Please drop off any hats you have completed and we will send them on to Innocent.